If you're a budding writer or just someone who sometimes fantasizes about writing a book one day, you have probably wondered, What are the steps to making a book? You know that there are many things that have to happen between getting the idea to write a book and seeing it bound on the shelves of a bookstore. You might be confused as to what those things are and what order you should tackle them in. Any kind of creative process needs to be personalized to some extent; no two writers create a book using the exact same process. However, there are certain major stages that you should at least be made aware. If you decide to tweak them to better fit your own style, you are free to do so, but at least you know some general steps that have worked well in the past. This article will help you answer the question, What are the steps to making a book? So What are the Steps to Making a Book? If you are asking yourself this question, you are already conscious of one of the most important things an aspiring writer needs to understand: writing is a process. Sometimes people think great writers sit down, wait for the inspiration, and crank out amazing work. This is not the case. In fact, the better the writer, the more involved and in depth their writing process likely is, and the more work they put into their craft. Once you let go of the notion of the genius writer you are free to understand how books really get written, which is through hard work and dedication. Of course you have to have some talent and a natural aptitude for the written word, but it is really more about hard work than magic. The greatest writers would tell you the same thing if you could sit down with them and talk shop. So here are some of the most common steps that writers go through when they are making a book. Get Mentally Prepared - Writing a book is a lot like running a marathon. You don't just buy running shoes one day and head out your front door thinking you're going to run a full 26 miles. 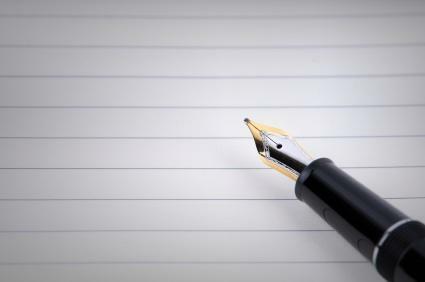 In the same manner, you don't just grab a pen one day and start writing a novel. You have to understand that writing a book is a long, involved process. You need to dedicate some time every day to writing. You need to develop a schedule that works for you, and set certain goals for yourself before you start. If you don't do this, you'll likely spin your wheels for a long time without really getting anything moving in a forward direction. Know Your Audience - Why are you writing this book, and who are you writing it for? What kind of book are you writing? Can you visualize the types of people who will be interested in buying and reading your book and telling their friends about it? You should always have your audience in mind when you begin a writing project. It helps your project maintain a focus through the long days and nights of creation, and when your book is finished, knowing whom you wrote it for is invaluable when it comes to marketing. Write your book - Of course, this step is not one that occurs is a vacuum. You will be writing and revising, starting and stopping, reviewing and revisiting throughout the larger process of making a book happen. While you write, it helps to share your work with people you trust as you go along. You need to check in with how your work is being received by others so you can adjust your approach as you go along. Publish and Market - Once you have a manuscript in the can, you need to do something with it. Finding a publisher can be a difficult task. You need to find one that understands what your work is trying to do and can help put you into contact with a market that wants to read your work. Once you have someone to publish your book, you need to go out and try to sell it. This means going on a speaking tour, doing book signings, and talking to book lovers about your book to drum up interest. Rejoice! - If you have seen this process through all these steps, you have accomplished something that many people try to accomplish but ultimately fail at. You have beaten the odds in many respects, and you should allow the experience to give you confidence and a real sense of accomplishment. Don't forget to celebrate! Now if someone asks you, What are the steps to making a book? you will know the answer. Once you get through the process, the only thing for you to do is to start all over and do it again. A great writer is always focused on their next book, so keep your eyes on the horizon and always try to outdo what you have done before.